As I hinted to yesterday, I have been actively pursuing one of my crazy ideas. Though the offerings are small now, I have officially opened up Nerd Horse! 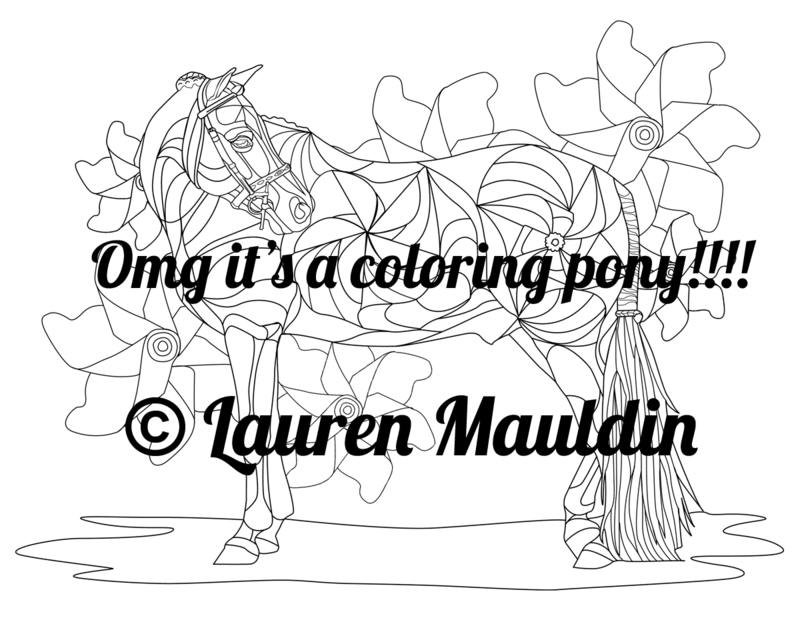 Right now, I have 4 equestrian themed complicated coloring book pages available for instant download. This is pretty much a fun experiment, so if I make more will depend on if there are any sales or real demand. If you follow me on Facebook, you might have noticed that I sent out a survey last week about photography items that might be available for purchase. I got some really great feedback, and am currently investigating whether it’s a better option to invest in a nice photo printer or have smaller batches of notecards printed online or locally as a test. With web and graphic stuff I feel pretty comfortable, but physical printing is a whole new world to me! I certainly welcome any tips or words of advice in that area. I’m definitely curious for feedback about all this. Is there something you’d like to see? Something different about the designs? Lots of options and lots of places I could go with the idea if interest takes off enough… but we shall have to see! You totally need to do a cute painted warmblood with crazy designs. LOVE!! I recently bought a couple coloring books on amazon that are great, but anything horsey is WAYYYYYY better! I would definitely buy it! Ahhhh these are awesome! I’ll be buying a few! OMG. SO EXCITED! This is making me geek out unnecessarily. Love this. You are so talented. These are just beautiful. Yay!! Definitely will get! I didn’t realize when you had done these in the past you had made them too. That is a great idea for an etsy shop. I’m gonna go with the Good Crazy Idea side. Thank you for sharing and being crazy! I just ordered mine! Can’t wait to start coloring them! YES! 🙂 An offering that I think would be a great idea (keep in mind I have NO idea what all goes into creating these. If it is super time consuming/not worth it, feel free to ignore) would be the option to have a custom one drawn of our own horses so we could color them. Every horse I colored as a kid ended up graced with Logan’s markings despite the coloring book image being of a stock horse (if I was lucky and it wasn’t a cartoon Barbie pony ha) and Logan was a saddlebred, so it wasn’t an accurate likeness by any means. 😉 Obviously they would need to be higher priced than the stock ones, but that’s just where my brain is. I know I’ll be buying all of the ones in the shop currently! Oooo intriguing. I also like this idea! I was contemplating offering something like that, but am stuck on the price. What would people be willing to pay for this? I can churn out a page to offer at a cheap price, because I’m hopefully going to have it downloaded multiple times but custom pieces would be a one shot kind of deal. Would 20 to 40 cover your time? I would be examining how difficult these are to make for you. How much time does it take you? Are they fairly difficult to create? Would you turn down photos that would be to difficult to create? If you do consider doing this, I would make some guidelines for the photos submitted. I am sure you would receive photos similar to what I got for paintings, and most of the time they are pretty awful to create from (not dissing the skill of the photographer or horse, etc, but the photos were generally difficult to produce grate detail from). That’s the magic of coloring! 🙂 I imagined them Emeralds when I made it, since those are my favorite. You are SO talented! They’re gorgeous! So many places you can market these too – not just for adults who love horses, but maybe art students, teens, kids, etc. I hope your store takes off! Lauren! I use a printing company called ProDPI for all my pro printing, canvases and all kinds of products, and they’re amaaaaaaazing. They give stellar pricing for the quality also and you can order samples at an even more discounted rate. Definitely worth checking out. If you wanted to sell prints, you just order it through them and send it directly to the customer in fancy packaging and everything. So great. By the way the shop looks AWESOME. Perfect! That’s the kind of information I’m looking for so I can move forward with the other shop ideas 🙂 Thank you! I love these! Definitively buying some! Congrats!! This is so cool!!!! I am pretty sure you are magic. These are amazing. NEED. I need an entire book of these. (Y’know, if you want. xD) In the meantime I am SO excited! I think the floral jumper is my favourite. *fist pump* Yes! 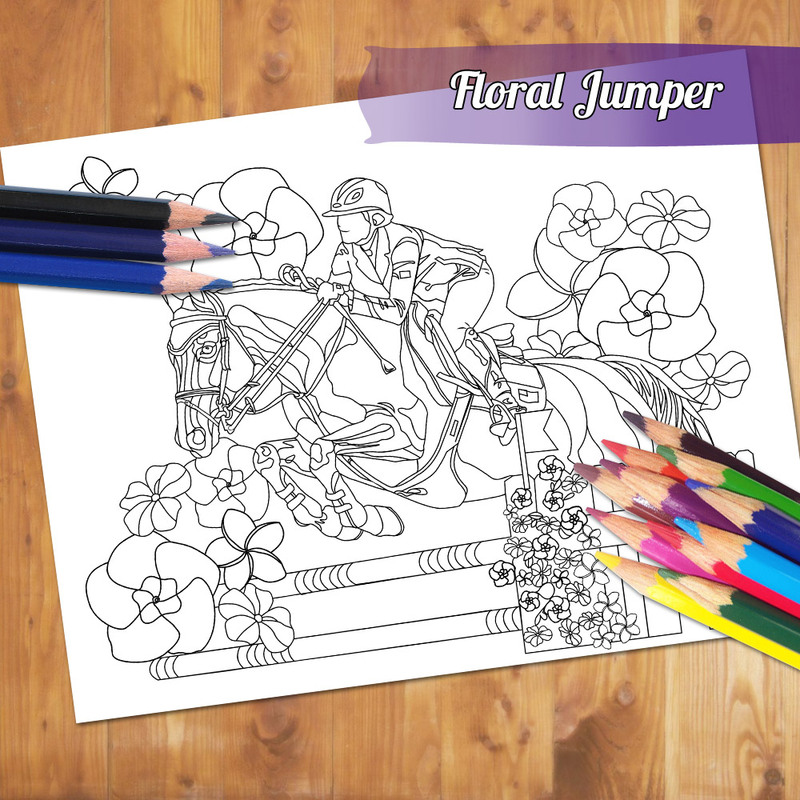 Equestrian coloring books! So excited. As far as online printing, some places will send you either proofs or samples of the paper. If they do, it’s absolutely worth getting a sample. Paper quality can really set apart cheap vs quality print jobs. I can’t necessarily recommend any online printers just because I tend to use a local print shop- which you may want to also consider since the prices may be comparable and you can definitely get proofs and see the various papers in the store. Let me know if you want to talk print details, like file setup, etc. Coolest idea ever! I saw an adult coloring book in one of the airport book stores I was in recently. Can’t remember which airport, but I thought of you. You’re so talented! Those are beautiful! Congrats on the Etsy store. I love these! My daughter and I love coloring books and have many but they skimp on good horse ones. I’m ordering all of them next week. I’d love to see a pony cart or driving coloring pages. Always enjoyed driving. Thanks so much for creating these! Love it! You know I am a huge fan of selling downloadables as a good business model. Best wishes on your etsy launch! Beautiful designs! Welcome to the wonderful world of Etsy! This just made my whole day and I’m heading over there to order ASAP. I’m off to the cottage tonight, and I feel like these colouring pages will combine perfectly with a pina colada and chilling by the lake. Um yeah I’ll be buying. Love! I can also vouch for ProDPI, that’s where I get my prints from as well. Their processing time for straight prints is pretty quick as is shipping, and the drop shipping direct to customers/clients is nice. They do have a multitude of products and paper types available, and when you set up an account they send you a sample pack of their various papers (at least they did as of a few years ago). In regards to a photo printer, I’d probably start out with finding an online or local place to do it till you see what sort of volume you’re doing. Then if you’re doing enough volume to justify the cost of a photo printer you can look in to it. Inks are not cheap, neither is good quality paper, so I’d probably not jump right in with making a purchase right away. If you do decide to get your own printer though, make sure you read up on printer profiles (they tell the software and printer which paper you’re using so they can adjust the flow of inks, etc). Having proper Printer Profiles are one of the most important things when it comes to photo printing and having it come out looking right. But for sake of ease an online place is certainly handy! LOVE IT! Totally buying them all. OMG this looks like so much fun!! I need coloring time in my life! Love this!!!! If I had a functional printer, I’d be all over them. Love it! What a creative idea. So much that I love about this! I just learned about adult coloring books (saw at Anyhropologie). Random questions but. 1) could you show an example of one colored? 2) what type of colored pencils do you recommend, if any? Fantastic! Awesome! Love the idea, love the pages! I can’t wait to find my colored pencils! Look incredible! Just had a look in AUD and they seem well priced, too!